When I first moved back to the Mainland from Hawaii, I really missed the food. Well, I also missed the weather and the ocean and my family, friends and co-workers, but food was high on my list of cravings. 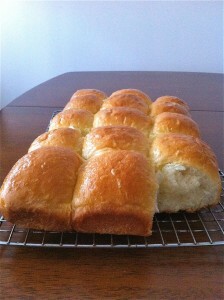 King’s Hawaiian Sweet Bread was high on the list. Eventually, King’s Hawaiian was distributed in the Midwest! Hooray. (It makes the best French Toast, by the way.) 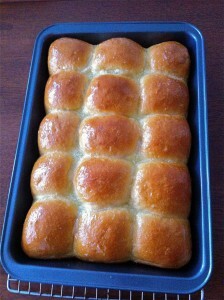 But by then, I had found a bunch of copycat recipes, so I tend to make my own now. 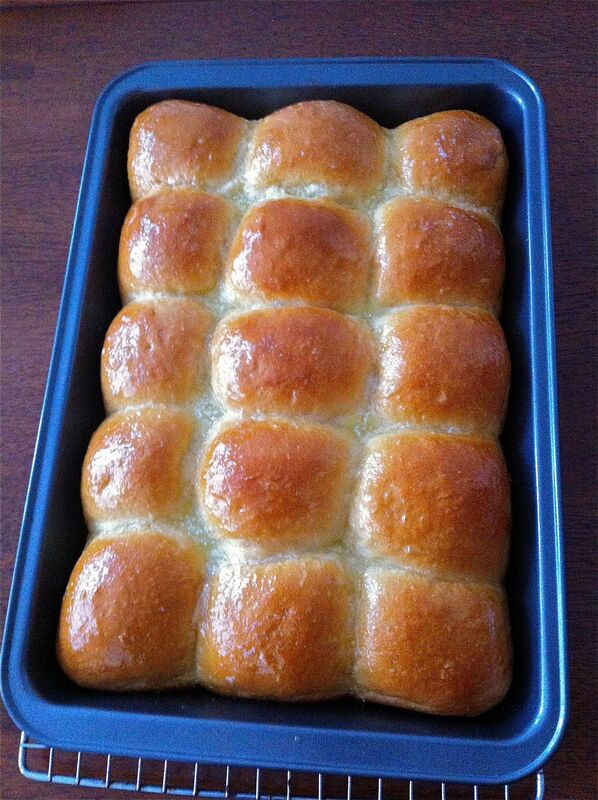 Here’s a version I use, based on a bunch of sweet bread recipes I’ve tweaked slightly. 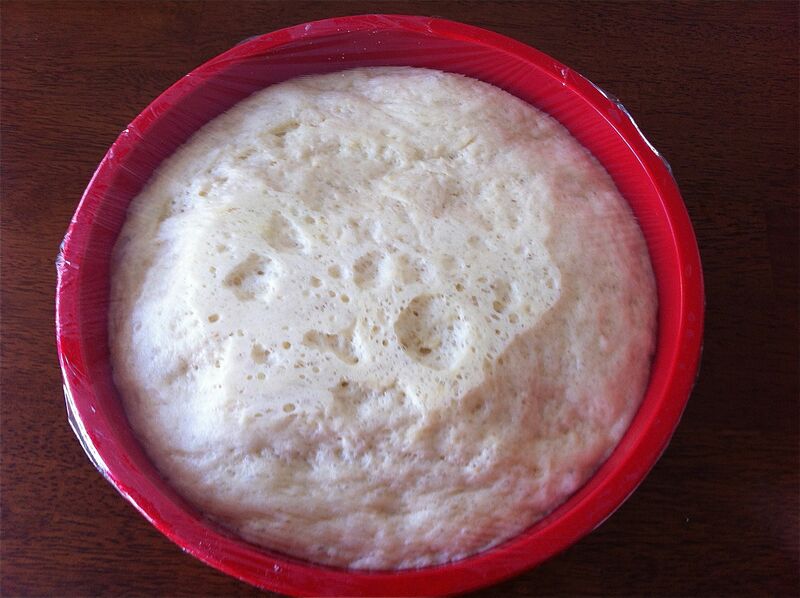 My mom used a similar recipe, but made the dough a day ahead and let it take its first rise in the refrigerator overnight. She used it to make cinnamon rolls and coffee cakes for holidays. Some versions use pineapple juice in place of some of the water for added sweetness. Devany Vickery-Davidson calls her version Aloha Rolls. The finished rolls are great for Thanksgiving dinner, but also are perfect for leftover turkey sandwiches. Or use a knife to cut a deep “X” in the top of each roll. Stuff each with a squished roasted garlic clove, some shredded cheese and a little splash of broth. Cover with foil and reheat. 1. Combine all ingredients except for the optional melted butter. I like the feel of dough, so I stir as much as I can together with a wooden spoon, then knead with my hands until it becomes a soft, smooth dough. A mixer with a dough hook works, too. Put dough in a lightly greased bowl, cover, and let rise until double. I like to put the bowl on the bottom shelf of my oven with the oven light on. (Do not heat the oven.) The oven light provides just enough warmth to hasten rising. 2. 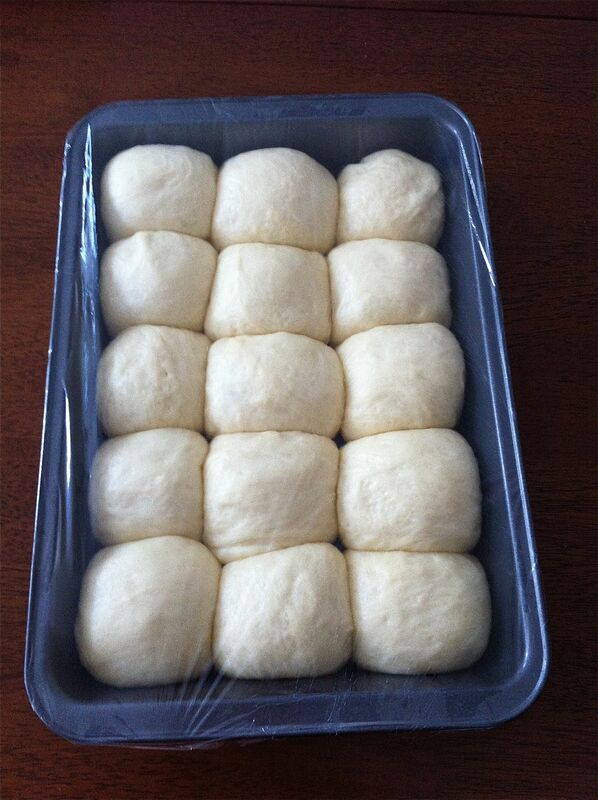 Punch down dough and divide it into 15 pieces. 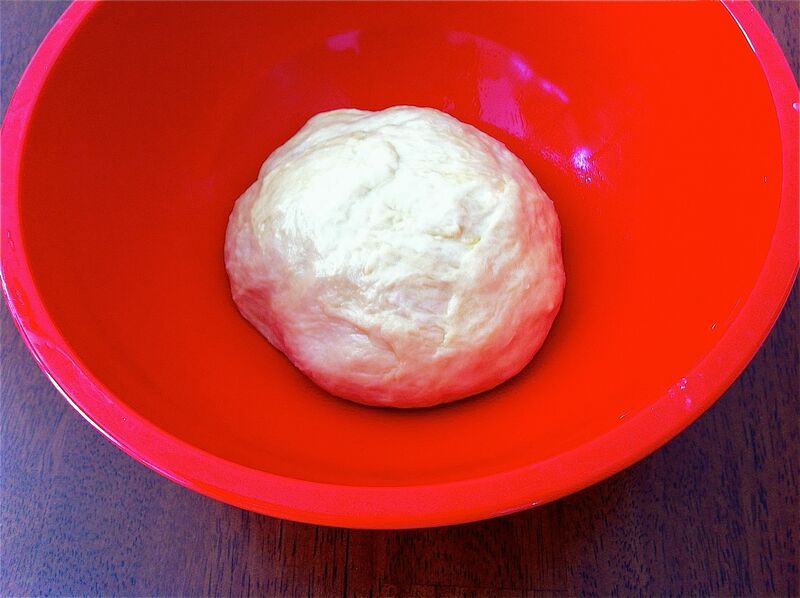 Shape into balls and place in a greased 9×13-inch pan. Cover pan and let rise until almost double, about 45 minutes. Bake in a preheated 325° oven for 20 to 25 minutes or until golden brown.